Winning 21 Olympic gold medals certainly builds up an appetite. Much ado has been made about Michael Phelps’ diet for the Rio Olympics, and for good reason — the 31-year-old American swimming champ is now the most decorated Olympian of all time, having just nabbed his second gold medal in one night (and 25 Olympic medals in total), on Tuesday night. But while his dominance in the swimming pool hasn’t changed, Phelps’ diet over the years certainly has. During the 2008 Beijing Games, Phelps famously told reporters he ate 12,000 calories a day while training. Breakfast consisted of several egg sandwiches, followed a five-egg omelette, chocolate-chip pancakes, French toast and grits. For lunch, Phelps would eat a pound of pasta, along with a couple of hand-and-cheese sandwiches (and a few energy drinks, too). Dinner would be another pound of pasta, followed by a whole pizza. The hefty diet paid off. Between his many meals, Phelps took home a record eight gold medals in Beijing. But by 2012, Phelps’ diet had changed. 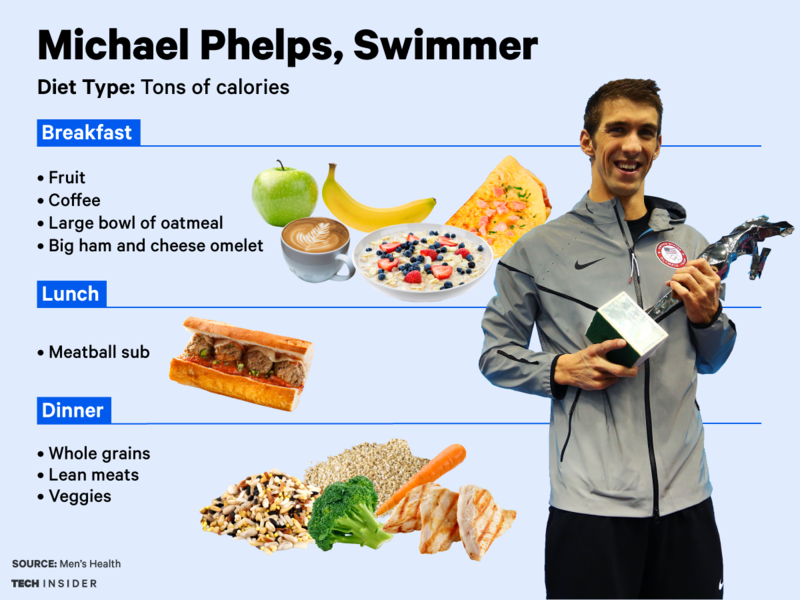 An athlete now in his 30s, Phelps is more careful about what he eats, in a sense, though he’s still a calorie-consuming machine, taking in about 8,000 calories a day, or four times what the average adult male eats. He’s swapped his multiple egg sandwiches for a big bowl of oatmeal with an omelette and a side of fresh fruit and coffee. Meanwhile, lunch is still a 1,000-calorie meatball sub from Subway. Gone are the whole pizzas, however. Instead, dinner is a well-balanced meal any nutritionist would approve of — a plate filled with whole grains, lean protein and fresh vegetables. “I used to think that ‘healthy’ meant that it wouldn’t taste good,” Phelps tells Men’s Health. He’s since credited his switch to cleaner eating for his success. “It’s like putting higher octane fuel in a car — I run better when I eat better,” he says.